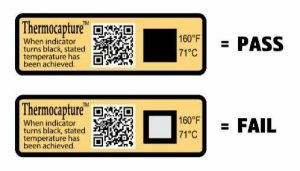 Thermocapture™ DL is a personalized self-adhering, waterproof, colour-changing label that measures the surface temperature of dishware in commercial dishwashers. Using Thermocapture™ DL on a dish surface with each wash cycle will indicate that the proper dishwasher temperature has been reached for sanitation. Label is adhesive backed, can be customised to your requirements, accurate to 1ºC and provides proof of HACCP Compliance. Thermocapture™ App will photograph the irreversible temperature label capturing your information, including the pass / fail colour change and upload data and images to your password protected data base / web page, automating record keeping! Tags record with location and time. That’s it. Data is stored on your smartphone and on your password protected page where images and data can be viewed or downloaded for validation purposes.